Knock, knock: the return of the propiska? Reports from Moscow of door-to-door passport checks and a proposed new bill criminalising registration infringements are rekindling uncomfortable memories of the Soviet past. Mikhail Loginov reflects on the history. The law about so-called ‘inflatable flats’ has still not gone through parliament, but both police and people from housing management companies are already going round buildings trying to catch unregistered residents. ‘It’s going to be like the Soviet Union all over again’, say those who remember the old days. Historically, Russia differed from other countries, in Europe and beyond, in that land was plentiful but labour scarce. Serfdom appeared relatively recently, at a time when it had been abolished or modified in many other parts of Europe. Not only peasants, but urban tradesmen were forbidden to change their place of residence without the permission of the authorities. The government could move whole groups of craftsmen – blacksmiths or carpenters, say – to some distant town with their families without consulting them about whether this suited them or not. The Russian state continued to exercise control over its citizen’s movements, and Peter the Great’s reforms did not bring freedom to the lower classes, just increased political control over their lives. Following the example of other European countries of the time, passports were introduced for the upper and middle classes, although, unlike European passports, these had nothing to do with foreign travel, but only gave them, the right to move freely about the Empire. The passport system was also used to help people its more distant regions. In the second half of the 18th century, for example, women without a passport who refused to say where they came from were transported to the Siberian city of Omsk, to provide wives for the troops and officials stationed there. The word ‘bespasportny’ (‘a passportless person) also became a synonym for ‘tramp’. The second half of the 19th century saw a colossal expansion of industry in Russia, and the mass migration of peasants from the countryside to the towns. The government relaxed the passport system to allow this, although Jews were confined to ‘the pale of settlement’ and forbidden to live in all but a few centres of population in the western part of Russia. At the same time, members of liberal and antigovernment circles were liable to be sent into internal exile in small towns and villages. Some of these exiles were not permitted to leave their place of residence; others could travel but not visit a city for more than one day. The 101st kilometre and the limit. And, indeed, internal passports were abolished immediately after the revolution. But the communists soon realised that the building of socialism was incompatible with freedom of movement. Various forms of identity documents were introduced, and eventually an internal passport system was re-established. Under this system, for example, former aristocrats and priests, as well as their families, were forbidden to live in large cities. Also, a convicted criminal from Moscow or Leningrad could not return there on his or her release, but had to live no closer than 100 km from these metropolises, hence the expression, common at the time, 'exile beyond the 101st kilometre’. Alexander Solzhenitsyn, for example, wasn’t allowed to live in Moscow for some years after leaving the GULAG, and worked as a schoolteacher in Ryazan. From the 1930s onwards, millions of peasants began to stream into the towns from rural areas. They were welcomed in industrial centres, but for Moscow and Leningrad, as well as the capitals of other republics within the USSR, such as Kyiv, Tashkent and Tbilisi, the so-called propiska system was introduced. Of people not born in these cities or married to locals, only students and factory workers could come to live there – and in the case of students they had to return home after their studies, unless they could find a local job (not easy), or a husband or wife to provide them with a precious propiska. Some factories in large cities were allowed to hire a certain quota (known as a ‘limit’) of workers from elsewhere, who were housed and received a propiska, but were looked down on by the locals who referred to them as ‘limitees’. By the end of the Soviet period, the ‘propiska’ system was harsher than the passport regime before the 1917 revolution, with any infringement leading to expulsion and even in some cases a prison sentence. Anyone found in Moscow or other city with propiska restrictions without the necessary stamp in their passport had seven days to leave. Sometimes the government used repressive practices reminiscent of the 1930s under Stalin. Before the Moscow Olympics of 1980, for example, various ‘antisocial elements’, from prostitutes to dissidents, were forced to leave the city for the duration of the games, and people from outside Moscow were not allowed in either. So the only people left in the capital during the games were those with a Moscow propiska. The propiska is dead. Long live registration! In 1991 the Constitutional Court of the USSR declared the propiska system unconstitutional, and abolished it from 1st January 1992, although by then the USSR itself no longer existed and it fell to the new Russian government to implement the change. 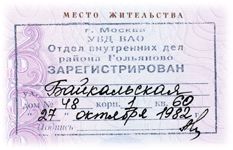 In July 1993, two months before its dissolution, the Supreme Soviet passed a law giving Russian citizens the right to choose their place of residence, anywhere in the country, and introducing a system of local registration. One difference was that whereas the propiska system tied residents only to a given town or city (a passport stamp would, for example, show that a person had officially moved from Samara to Moscow), a registration stamp indicated the specific flat, building and street where someone lived. The main difference between the systems, however, was that the propiska was prescriptive (you could be denied residence rights), while registration was descriptive, and officially available to all. There were also two types: temporary, for people moving from one place to another for a specific length of time, and permanent, for those moving for good. Its critics, however, pointed out that it retained a regulatory element. You could only be registered at an address either with the permission of the building’s owner, if it was a private rental, or the occupier and all the adult members of his or her family if it was council property. The only way to register without getting permission from anyone was to buy a property and bring the deeds with you. But this option was available to very few people, either in the 90s or later. The new law met with strong resistance in certain parts of Russia, and particularly in Moscow. Yury Luzhkov, the city’s mayor, announced that he would not implement it and refused to abolish the propiska system in the capital. It took four years and a ruling by the Constitutional court for local officials to start registering newcomers to the city in the same way as other regions. Someone found living somewhere without being registered was no longer taken to court and forced to leave a city, as happened in Soviet times, but was merely fined. However, you needed a registration stamp in order to marry, get a place for your child in a council nursery or state school and access public healthcare. People arriving in Moscow on a temporary basis were required to register within three days, which resulted in the city police stopping anyone they thought looked suspicious. The only way to avoid arrest (or the payment of a bribe) was to show an air or rail ticket showing that you had just arrived in Moscow and were leaving on the same or the next day. Migrant workers from former Soviet republics (Ukraine, Moldava, the Central Asian states) were subject to particular harassment. Political developments in Ukraine, however, led to a relaxation of the temporary registration rules. In the country’s presidential election at the end of 2004, Viktor Yushchenko and Viktor Yanukovych made it through to the second round. The Russian government was rooting for Yanukovych and to encourage Ukrainians to vote for him it extended their right to stay in Moscow without registration to 90 days, after which it was forced to make the same concession to everyone, including people from other parts of Russia. Yanukovych lost the election, but the change remained. The attitude of Russians to the abolition of the propiska was more neutral-to-negative than positive. Its most vehement critics were the inhabitants of cities that during Soviet times had been out of bounds to anyone without a local propiska because of their proximity to military installations or the USSR’s borders. These ‘closed cities’ enjoyed better facilities and provision of food and other goods than the rest of the country. Ivan Nikitenko, a retired naval captain living in Kronstadt, an island in the Gulf of Finland near St Petersburg and the traditional base of the Russian Baltic Fleet, told me about how life there has changed. Russia’s border zone is also still closed, except for transit, to anyone without local registration. The local authority at Norilsk, an industrial centre north of the Arctic Circle, recently tried to have the city declared a closed area, since it is nominally part of the border zone. A majority of local residents supported the idea. The inhabitants of other large cities, and particularly Moscow, are also unhappy about the constant stream of Russian and foreign incomers. People talk about them ‘taking over’, and complain that ‘Moscow isn’t inflatable’. The capital attracts people from other Russian regions because it offers work, the chance of a business career and a high level of services and facilities, while for citizens of former Soviet republics it means one thing – the chance to earn good money. The nationality of migrant workers has changed a lot: ten years ago the average gastarbeiter was a Ukrainian or Moldavian; today they’re more likely to come from Tadzhikistan, Uzbekistan or Kirghizia. Muscovites have seen their city filling up with people with a different culture and mindset and have started to ask, ‘how have they ended up in our affluent Moscow?’ It has become obvious that unlike the Soviet propiska system, registration can’t control labour migration. And if you break the rules you’re not sent back home or to prison – you just pay a fine of less than 100 roubles (£2). On the streets of Russian cities you can find posters advertising ‘mini-hotels, from 200 roubles (£4) a day’. Sometimes the rate is even lower. These establishments have nothing in common with European youth hostels; they are private flats being used as communal dormitories. Natalya Bondarenko, a St Petersburg shop assistant, lives in a two room flat in a prestigious building. She also owns another flat, in a cheap social housing block built in Khrushchev’s time, which she lets out to migrant Uzbek workers - between ten and sixteen of them at any one time. The local police officer knows about it, but in return for a small bribe turns a blind eye and never checks the flat out. Some migrant workers live in barrack type conditions outside the city limits, although they are registered as living in the city. There can be 50, 100 or even 200 people registered as living in one flat. For some citizens, many of them alcoholics, organising such registration is their only source of income. One roomed flats where up to two hundred people are registered are known as ‘inflatables’. The owners of these flats don’t always know that someone else is registered there, and sometimes only find out about their nonexistent lodgers when they receive an electricity bill or a court summons. The Russian government is trying to simplify its registration rules. In 2010 they set up a pilot project to allow temporary (although not permanent) registration to be processed online. A year later, however, it turned out that people were still having to visit a Federal Migration Service office to sign their completed application form – electronic signatures are practically not recognised in Russia. So much for simplification. At about the same time Vladimir Putin, as part of his presidential campaign, proposed that people who ‘organise accommodation for illegal migrants’ should face a prison sentence of up to five years. Once re-elected he didn’t forget his promise, and in January put up a proposal for legislation forbidding someone who does not intend living in a flat from registering themselves there, and also banning the registration of more residents in a flat than permitted under housing regulations. The law when passed will allow for a five year prison sentence or fine of up to 500,000 roubles for those who break it. It has not yet been passed, but in Moscow local police officers and housing management company employees are already poking around, trying to catch unregistered residents. The city authorities have been quick to explain that this is not a campaign against illegal migration, but an attempt to winkle out people enjoying their hot and cold water and central heating services without paying for them. It is true that not all Moscow flats have meters on their hot and cold water pipes, but no one is in any doubt that any unregistered migrant workers who may be discovered during these raids will be prosecuted under the new law, and the flat owners as well. Attitudes to Putin’s initiative vary. He has his supporters, but detractors as well: more than 40,000 people have signed a petition asking for the bill to be dropped. But even many of those who support him specify that the law should only to apply to foreigners, not to Russian citizens. But supporters and critics are agreed on one thing: criminalising registration infringements will essentially mean a return to the propiska system.